Please take care to ensure from this point that you use a power supply unit that can provide at least 2.5A at 5V with the RPi3. RPi2s are only set by default to supply low power via USB, meaning that many external 2.5-inch hard disks will not run. You must modify the Rasp Pi configuration in config.txt in order to provide more power on the USB interfaces – this modification is not necessary for RPi3. To undertake configuration work, log into the Rasp Pi OpenMediaVault via SSH as the root user with the password openmediavault. You now open the configuration file with the nano /boot/config.txt command and add max_usb_current=1 to the end of it, before saving the file and restarting the Rasp Pi. An impressive 1200mA (instead of 600mA) is available on the RPi2 Model B, meaning that an external 2.5-inch hard disk will function without the need for additional power. The next step is to open a web browser on the desktop computer and enter the IP address of the Rasp Pi as the URL. You will then come to a login screen, from which you first set the relevant language localization by means of a selection list and then proceed to log in as admin using openmediavault as the password. Moving to the last action for basic configuration of the OpenMediaVault system, you must install any pending updates. 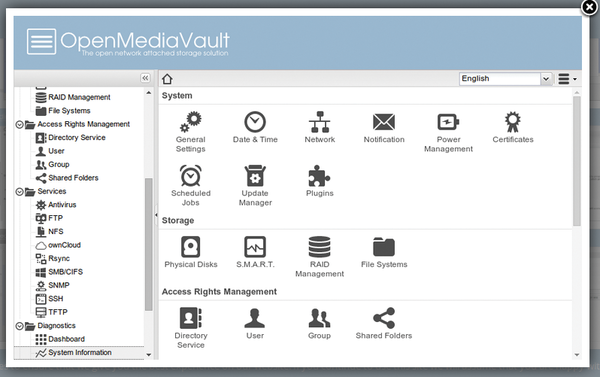 OpenMediaVault deploys Debian's Apt package system. Open System | Update Manager | Updates, displaying possible updates with Check, and install the updates that appear. Then activate the relevant options for automated updates in the Settings tab. OpenMediaVault, like most dedicated NAS operating systems, provides the option of integrating add-ons into the system. In the System | Plugins menu, you will find a wide range of additional applications sorted into sections. You can integrate any of these applications into the operating system with a mouse click. Install an application by ticking the names and then clicking Install (from the list view). The system loads the desired program packages from the Internet and installs them. OpenMediaVault keeps the plugins at the same update level as the system by means of the update routine.